When the Social Security Administration makes disability determinations, it uses a system that scales the work people do from sedentary to very heavy. The full scale is as follows: sedentary, light, medium, heavy, and very heavy. Sedentary work, as it happens, accounts for the majority of jobs in the U.S; indeed, 80 percent of jobs are classified either as sedentary or light work, according to the New York Times. A Residual Functional Capacity (RFC) assessment of performing less than sedentary work is required in order to be considered disabled under Social Security’s standards. As per the Social Security’s physical exertion requirements of § 404.1567, sedentary work does not involve lifting more than 10 pounds at a time. Sedentary work does involve occasionally carrying or lifting objects such as ledgers, docket files, and smaller tools. “Occasionally” can be understood to mean very little to one third of the time. Furthermore, for work to be considered sedentary, an employee who must hold a handheld medical assistive device must be able to do so without his or her work being impeded. If not, he or she may be considered disabled. Despite sitting for the majority of the time, sedentary work does usually involve some walking and standing. Generally, no more than two hours of the day will involve walking or standing for a job to be categorized as sedentary, while the remaining six hours of an eight hour work day are carried out while seated. Alternate sitting and standing ability is needed for most sedentary jobs. A job is defined as sedentary when walking and standing are a necessity on occasion, and when other sedentary criteria can be met, such as lifting over 10 pounds. Many people with back injuries are capable of standing and walking, as well as sitting for long periods, but stooping can quickly become problematic and painful. The majority of the work required by a sedentary job is usually performed while seated. Good hand and finger mobility and dexterity are usually necessary to perform sedentary work. If you are able to carry out most of the physical tasks associated with a sedentary job, such as lifting up to 10 pounds and occasional walking and standing, but you are unable to perform repetitive hand-finger actions, you may be found disabled. Other restrictions that erode the sedentary based of work may include visual, environmental, communication, and mental restrictions. 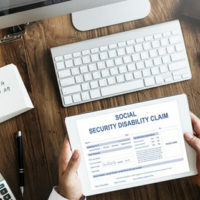 For all your questions and legal needs concerning Social Security Disability, call the West Palm Beach Social Security Disability attorneys of Celeste Law Firm at 561-478-2447 today. We are available to assist you immediately.